Led by iconic HOFer Bobby Hull and backed by an especially skilled defence that boasted Pierre Pilote and Al Arbour along with the immortal Glenn Hall, the Chicago Black Hawks finished the 1960-61 regular season in third behind the Leafs and Canadiens. The Habs would be met and defeated in the semifinals, with the Black Hawks slipping past Gordie Howe and the Red Wings in the final to claim the club’s third Stanley Cup championship. 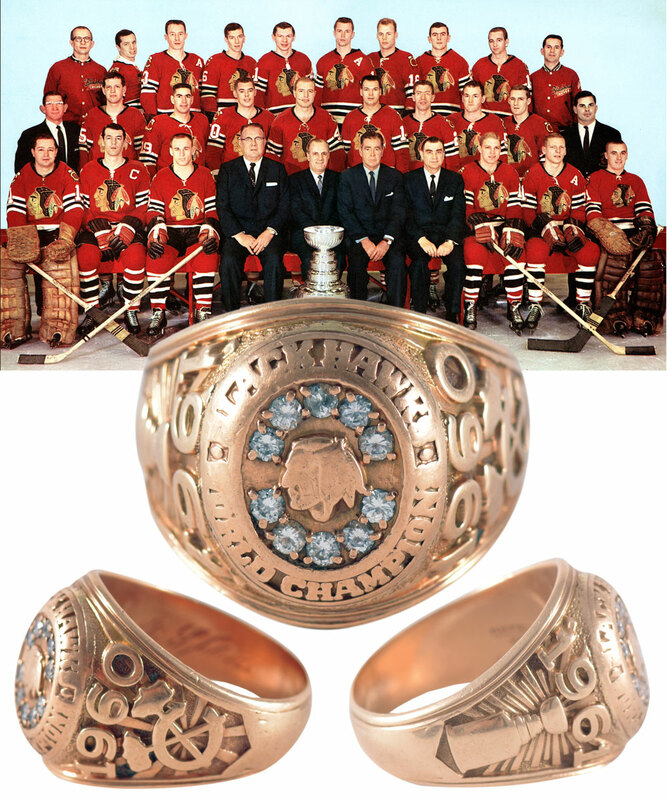 Extremely scarce and highly desirable as it represents Chicago’s only Stanley Cup victory of the Original Six era, we have a gorgeous 1961 Stanley Cup championship 10K gold and diamond ring, with this specimen all the more special, as it was presented to Leafs/Black Hawks legend Tod Sloan during his final NHL season! Size 13 with an approx. weight of 27 grams, a raised and worn Indian head motif is centered over the plateau and encompassed by 10 diamonds, with “Blackhawk” bordering above, “World Champion” below. The left shank feature’s a raised tomahawk logo with “1960” above, while the right contains a raised image of the Stanley Cup with “1961” above. 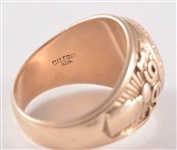 The inner band is stamped "Balfour 10K" and has Sloan’s engraved scripted signature of "M.A. Sloan" (Aloysius Martin "Tod" Sloan). Well worn with pride, many of the raised feature’s including the Indian head, text over the plateau, Stanley Cup and tomahawk all show heavy wear, with additional wear along with scratches and grooves to the outer band. 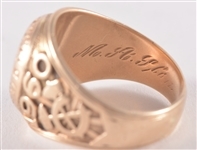 Despite the considerable wear, the ring presents beautifully, and would be a prize within any advanced Chicago Black Hawks or Stanley Cup ring collection. An LOA from the Sloan family will accompany this important keepsake. After nine successful seasons in Toronto with the Maple Leafs which would include a pair of cups, in 1949 and 1951, Tod Sloan moved onto the Chicago Black Hawks, spending three seasons in the Windy City, from 1958 to 1961.